How Will Ameritrade Perform In The Next 3 Years? What Are The Key Drivers Of Revenue For Ameritrade? In continuation with the solid performance in fiscal 2018, TD Ameritrade (NASDAQ: AMTD) posted another impressive quarter to kick off Q1 on a positive note. The company comfortably beat consensus estimates, with its revenue coming in at $1.52 billion and its adjusted earnings per share coming in at $1.11 (up 39% year-on-year). The robust growth was largely due to better than expected performance across core metrics – improved trading activity and strong growth in new client assets, coupled with the ongoing tailwinds from higher interest rates and lower corporate taxes. Ameritrade’s continued focus on client engagement and advisory services has helped it expand its customer and asset base, and consequently, quarterly revenues grew by over 20% year-over-year. Further, its strategic investment in ErisX should not only strengthen its position in the Bitcoin spot and futures exchange market, but also further boost its trading segment in the near term. We expect the growth momentum to sustain through 2019, driven by higher interest rate. Our price estimate for TD Ameritrade’s stock stands at $59, which is higher than the market price. We are in the process of updating our model to reflect the new guidance provided by the company. We have also created an interactive dashboard which outlines what to expect from Ameritrade in 2019. You can modify the key value drivers to see how they impact the company’s revenues and bottom line. Below we discuss some of the key factors that are likely to impact the brokerage’s earnings. Interest earning assets continued to be a big part of Ameritrade’s business, generating around 53% of the brokerage’s revenue in the December quarter. 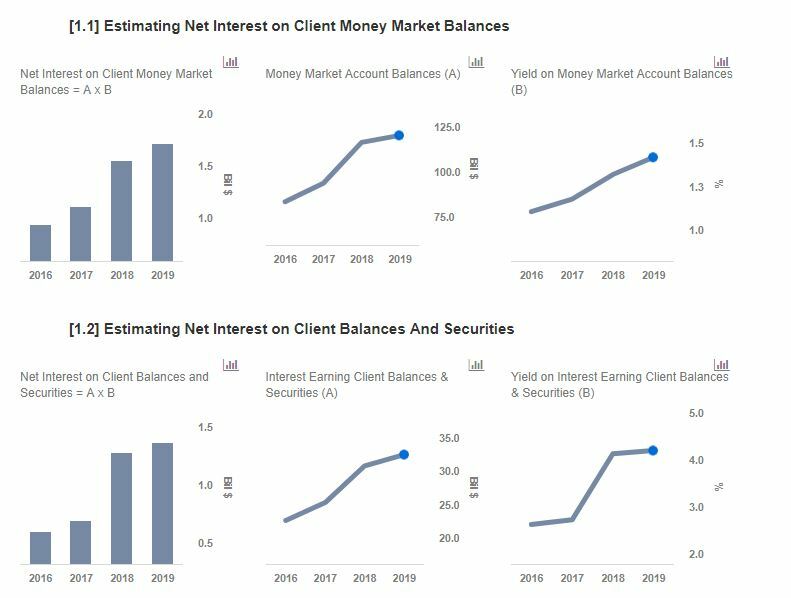 This segment grew by nearly 22% y-o-y to just over $800 million in Q1 FY2019, driven by a 26% y-o-y increase in average client balances, coupled with a nearly 50 basis point increase in yield. The net yield on these assets rose to 2.18%, still lower than that of other players such as E-Trade (2.7%) and Charles Schwab (2.39%). While the magnitude and frequency of further rate hikes in the year ahead are in some doubt of late, we expect the growth momentum to sustain through 2019, albeit at a slower pace. As a result of the continued momentum, we expect Ameritrade’s revenues from interest-earning assets to grow by nearly 10% to slightly over $3.1 billion in 2019. Transaction-based revenue accounts for 36% of Ameritrade’s overall revenue and saw its revenue grow to $537 million (+22% y-o-y) in Q1. Despite Ameritrade slashing its commissions per trade by nearly 30% to just under $7, owing to intense competition from discount and traditional brokerages, solid growth in trading volumes (+30% y-o-y) more than offset the losses from the price cut. In addition, enhanced stock market volatility, coupled with improvement in U.S. GDP and its strategic investment in ErisX, should result in increased near-term trading volumes – driven by enhanced client activity. As a result of this, we expect the trading commissions to improve by nearly 7% to about $2.1 billion in 2019. TD Ameritrade’s investment product fees saw nearly 8% growth for the quarter, primarily due to an increase in the number of customers seeking financial advice supported by technologically-driven insights. The company remains focused on addressing the demand for innovative financial products. The digital advisory business, and the company’s focus on newer investment products to meet customer demand, should drive these asset volumes and higher investment product fees in the future.